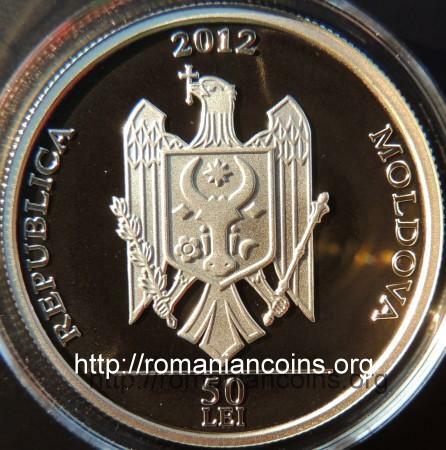 year 2012, circular inscription REPUBLICA MOLDOVA meaning "REPUBLIC OF MOLDAVIA" and the coat of arms of the Republic of Moldavia, in exergue horizontal line and denomination "50 LEI" a girl wearing a wreath made of wheat ears, inscription "SÂNZIENELE"
The night of Sînziene is the night before June 24th, when the celebration of Saint John the Baptist is celebrated, but also of Martyr Saint John the New from Suceava. 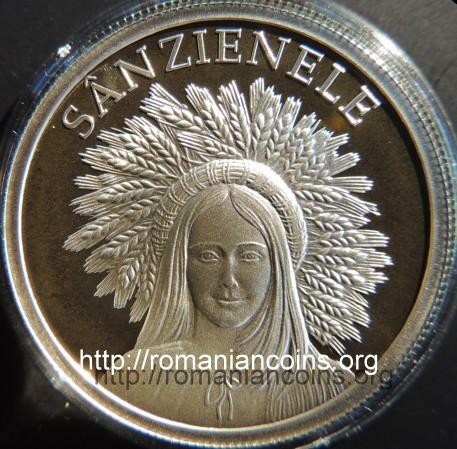 The name of "Sînziene" (that is a plural form, feminine gender) is spread in Moldavia. In the south of Romania the celebration is called "Drăgaică" (a singular form, feminine gender). As fairies, sînzienele appear as some beautiful maidens, that walk about dressed in white and love dancing. About the sînziene, the historian of religions Mircea Eliade notes the following [3, p. 246]: "The name of a specific group of fairies, Sînzienele, derives probably from Latin Sanctae Dianae. Sînzienele, rather benevolent zîne (fairies), have borrowed their name to the important Christian celebration of Saint John the Baptist.”. In  sînzienele are described, on the contrary, as malevolent zîne. Another old testimony - dated back to 1718 - belongs to Anton-Maria del Chiaro, the secretary of prince Constantin Brâncoveanu. In his book about Wallachia, the chapter entitled "Rites of the Wallachians", del Chiaro wrote: "Interesting to notice is the representation on Saint John the Baptist, when manly dressed maidens, and one of them with a sword in hand pass to houses of folks, where they act and represent Herodias with the executioner, who severs the head of the Saint Precursor, which is sooner fit for the day of August 29th. The maiden who dances with sword in hand is named by the Romanians Drăgaica.”. The celebration should probably be associated with the summer solstice and the harvesting of wheat. It is believed that the night of Sînziene is very auspicious for gathering cure herbs because then the magic energy is very strong. The night of Sînziene is auspicious for various forms of divination (in the past the girls tried to dream their fated husband, the villagers wanted to find out how the household and livestock would thrive), as well as for rituals meant for attracting fertility (women were rolling bare skinnedly in dewy grass, before sunrise). Drăgaica was necessarily to be a beautiful maiden, wearing a wreath of wheat ears and accompanied by a party of several maidens dressed in white and bearing wreaths of Lady's Bedstraw (sînziene) flowers. (The scientific name of the species is Galium verum. 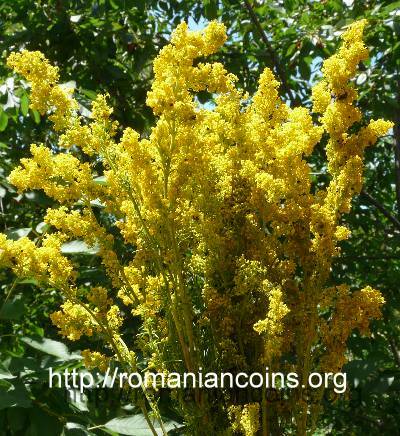 In the time of the celebration the yellow sînziene or drăgaice start to blossom, with pleasant scented flowers.) The company of maidens wanders the village and dances at crossroads. The procession has benefic effects over the ripeness of fruits, also stimulating earth's fertility. In 1934 writer Mihail Sadoveanu published a book entitled Nopţile de Sînziene (Sînziene Nights). Mircea Eliade wrote also a book with a resembling title, Noaptea de Sînziene (Sînziene Night). 1. Cantemir D., Descrierea Moldovei. Editura Minerva, Bucureşti, 1986. 2. del Chiaro Fiorentino, A.M., Revoluţiile Valahiei. Viaţa Românească, Iaşi, 1929. 3. Eliade M., Istoria credinţelor şi ideilor religioase. vol. 3, Editura Universitas, Chişinău, 1994. 4. Kernbach V., Dicţionar de mitologie generală. Editura Albatros, Bucureşti, 1983.